Sitting by the roadside on a summer’s day Chatting with my mess-mates, passing time away Lying in the shadows underneath the trees Goodness, how delicious, eating goober peas. 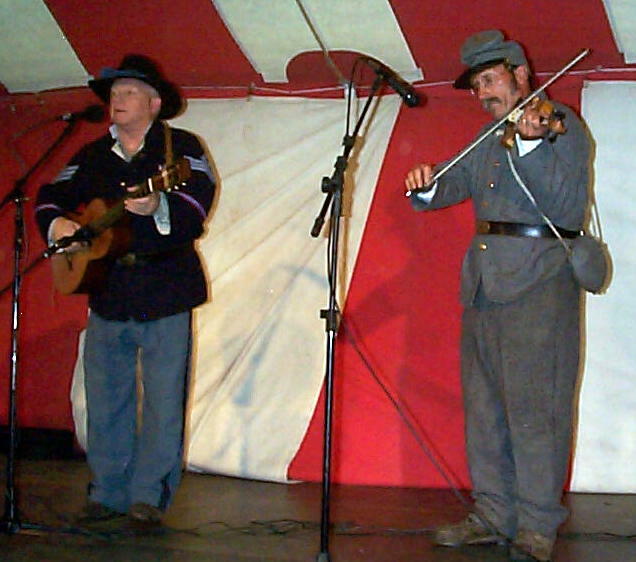 Under the Chautauqua tent in Coshocton, Ohio, music of the Civil War entertained the crowd. Performed by Steve Ball and Larry Stahl, “Goober Peas” was one of the most popular and silliest songs of that era. Not only did they sing such old popular songs as “Rally Round the Flag,” and the most popular love song of the day, “Lorena,” but they gave a short history of each song. This made for an interesting introduction to the 2011 Chautauqua Civil War evening. 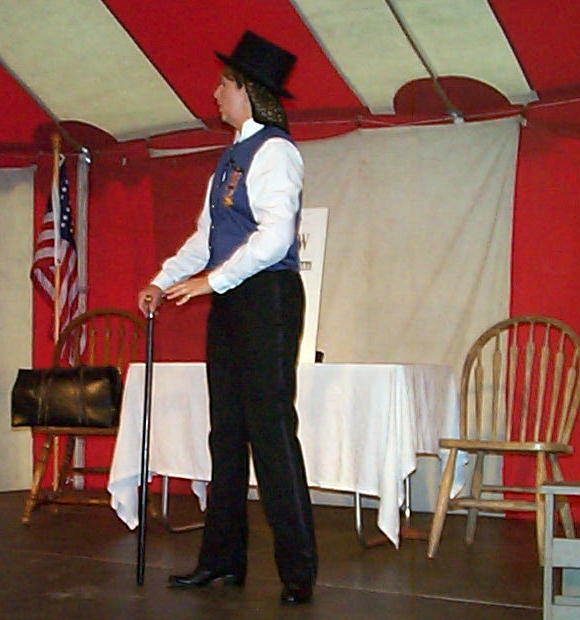 Guts, determination, and lots of humor described Dr Mary Edwards Walker as she was indeed a Civil War female activist. Debra Edwards Conner, a native of nearby Cambridge, gave an outstanding performance in the role of Dr Walker. The crowd under the tent, gave her their undivided attention at the Coshocton Bi-Centennial celebration. As a graduate of Syracuse Medical College in 1853, Mary headed to Washington to assist with the wounded of the Civil War. Cots were set up in the halls of the US Capitol and even amid the exhibits of the US Patent Office, where Mary eventually worked as an unpaid volunteer. Her request for a commission was denied as they felt a woman’s brain was too small to remember medical knowledge. Medical care was not high on the list of priorities for the military at that time as noted when one general said, “If all doctors sank in the ocean, it would be better for mankind and worse for the fish.” Death surrounded her as filth accumulated everywhere from improper disposal of waste. Two thirds of the deaths were from Tennessee Quick Step…dysentery. While little equipment was provided, there was a blade for amputations. During the course of the war, Dr Walker said three fourths of nearly 39,000 amputees survived. Using a chloroform soaked rag for anesthetic, it took three minutes to amputate, stitch the wound closed with cotton thread, and then wait for infection. Accused of spying by the Confederates while on a medical mission, Mary spent four months in Castle Thunder Prison. There she slept on the floor on a bed of straw in a room overrun with rats. Maggots usually crawled in their infested food supply. They were served” Lincoln coffee,” wood splinters boiled in water. When released from prison in exchange for a Confederate surgeon, she weighed 69 pounds. Her health and eyesight deteriorated greatly during this prison time. After the war, she was honored as the first and only woman to have ever received the Congressional Medal of Honor…and that honor stands to this day. At one point in 1917, the medal was rescinded by the government saying that it should only be given to those engaged in actual combat. The determined Dr Walker refused to give them back the medal. Instead she made herself a uniform, promoted herself to major, and wore the medal proudly wherever she went. However, Jimmy Carter in 1977 restored Walker’s Medal of Honor. Dr Mary Walker was indeed a trailblazer for women’s rights and certainly deserved the title of “Original New Woman” for her profession and dedication during the time of the Civil War. The word “obey” never appeared in her vocabulary. “I didn’t think all you Yankees would show up,” quipped Harriet Tubman as she entered from the rear of the easily recognizable red and white striped Chautauqua tent. Her sense of humor sparkled all night long as Harriet delighted the audience with stories of her leading slaves to freedom on the Underground Railroad. Ilene Evans portrayed Harriet Tubman for this year’s Ohio Chautauqua presentation at Coshocton’s Bi-Centennial. She was a master storyteller and inspired young and old alike as she wove her story keeping the audience involved with rolling bandages and singing songs. On the plantation where she was born in Maryland, birth records were not kept. Harriet was never certain about her birthdate. When she was about twelve, an overseer struck her in the head with a two pound weight when she attempted to defend a run away slave. This resulted in sleeping spells for the rest of her life where she drifted away for so long that she missed happenings in her surroundings. In her twenties, her escape from the plantation to the North began her lifelong quest for freedom of blacks from slavery. During her time of freeing the slaves, Harriet served with the Union Army. There she took care of the injured soldiers, made and distributed bandages, and learned where the supplies were kept and where bridges were being mined. Often she said the injured men were covered with flies, so healing was a difficult proposition. The first United States Colored Troops during the Civil War did not receive any pay for eighteen months. So their wives had to support themselves and their children by doing laundry for the officers, making pies and cakes to be sold to the boys in camp, and brewing ginger beer. 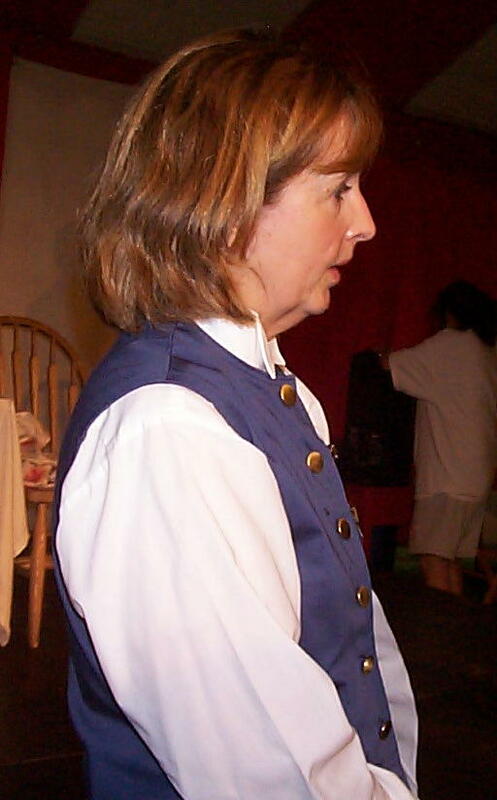 Harriet had nine scouts and a riverboat captain in her command. But this bold, young lady in her twenties said, “She felt no fear as long as she was doing what God wanted.” She did however believe in a faith that required action and good deeds. She waved the 35 star flag proudly as she talked about her role in this fight for freedom. After her performance, the tent was opened for questions from the audience to which she gave candid answers. Harriet felt that after the Civil War even though the Emancipation freed the slaves, they still had no rights. She had hoped that the war would not be just a vehicle of freedom, but a way to real equality. She thought that President Lincoln moved way too slowly during the war years both in abolishing slavery and allowing blacks to fight as soldiers. Later wished she could have thanked him, at least for the end result. The biggest disappointment in her life was an issue she didn’t really like to talk about because it hurt her so much. After the war was over, she returned to her husband, who was still living in the South in their family home, hoping he would go North with her. When he met her at the door, he had his new wife there with him in the cabin Harriet considered home. One of the happy moments for Harriet that evening in Coshocton occurred when a third grader in the audience stood to ask her his second question of the evening: “Could I give you a hug?” He rushed down the aisle between the folded chairs and they hugged on stage while Harriet remarked, “This is the best present I could have.” The young boy’s mother later stated that the young man had been reading all day about Harriet Tubman before coming to the evening presentation. 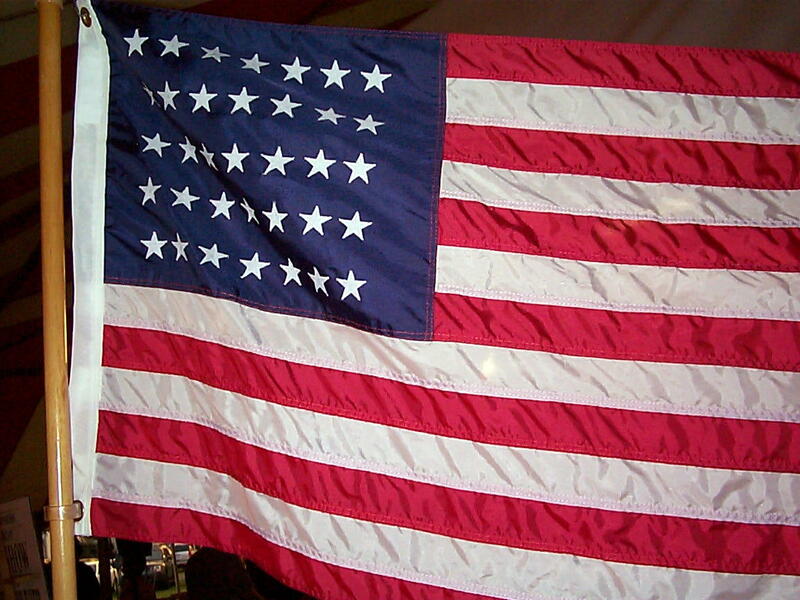 Freedom is what this country, the United States of America, is all about. It was begun with freedom at its core, and the hopes and dreams of men and women still struggle to maintain that freedom today. God bless the USA!